If you visit Dhaka court area you will find a man with couple of bundles pen. The name of the man is Abdul Qader but people called him Kalamwala Vai. Abdul Qader is serving people for 25 years of his 65 years life by selling pen to the people of court premises. He has no shop in the court area but turned to a big shopkeeper to the people. Most of the officials and lawyers of Dhaka court buy pen from Kalamwala Vai. He is now living in a mess of Nababpur where his wife and children in village home. Kalamwala Andul Qadie said, the profit I get from pen selling is very little but I could not stop this business. Due to the lacking of education, there has some soreness in my mind. So I am trying to remove the agony by getting company of educated people. The people who regularly visit court area always found Qader with pen holder in his both hands. Two pockets of his shirt also filled up with pen while a bag hanging on his shoulder also packed with the same item. He roamed around the court area from 9 am to 5 pm carrying various types of pen. You could get pen from his collection which prices ranged from 5 taka to 1,000 taka. Before starting this business, he was working in a pen factory in 1968. He learned to know the technique of pen manufacturing from there. 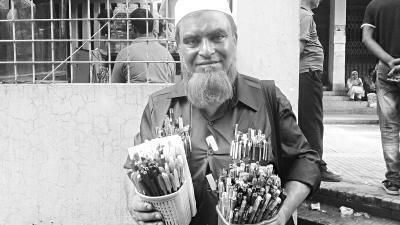 Kalamwala Vai said, in spite of the low profit, I am running my livelihood by selling pen. I was able to run my family with the sale proceeds before but now it is becoming difficult to carry on the family with the little profit. He claims that, now the sale has plummeted compared to the past. In spite of that I could not leave the business.